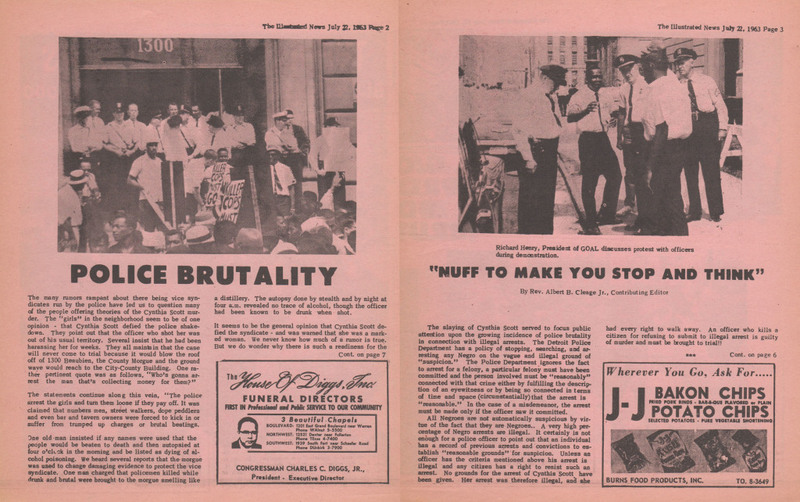 Police brutality was a problem in 1963, as it is today. Today I am sharing an issue of the Illustrated News that covered a demonstration held in front of the Detroit police station, then at 1300 Beaubien. The protest was against the killing of Cynthia Scott, an unarmed woman. She was shot in the back. The demonstration was peaceful and there was no interference by the police. The article says there were 2,500 people at the protest. Also “We wonder if a grand jury investigation might not clear the air and throw some light upon the police brutality practiced on Negroes and why such shootings never come to trial.” And that is something people are still wondering today. There was no investigation and the officer was not charged. Click on all pages to enlarge enough to read them. 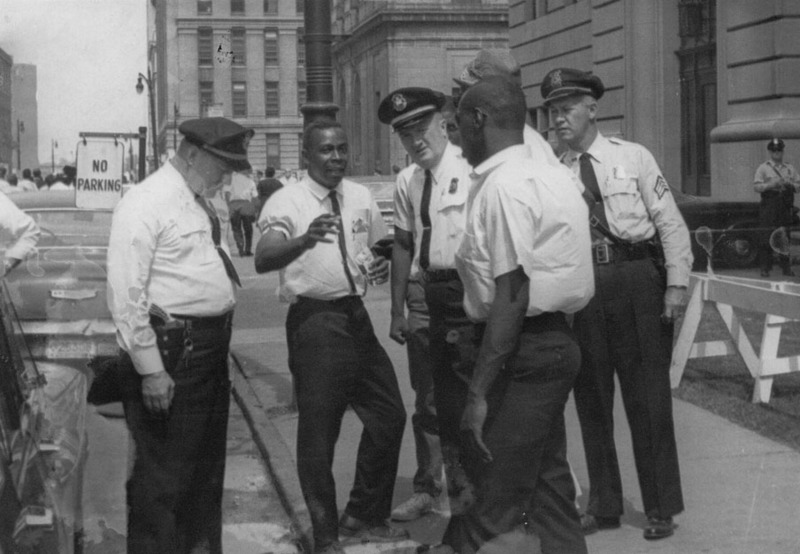 Richard Henry, later known as Imari Obadele, President of GOAL discusses protest with officers during demonstration. Picture lower left includes Malcolm X’s brother, Wilferd X and my father, Rev. Albert B. Cleage Jr. On my father’s left in the beret is Charles Simmons. Nice post, as usual. Your readers might find of interest my last Facebook.com post on April 9, 2013, which I’ve attached below. In it, I explicated the photo of your father with local Nation of Islam Minister Wilfred Shabazz (formerly X, originally Little) and, behind them, Detroit Wayne University activist Charles Simmons. My post was a wry tribute to the latter, who was one of my Howard University professors. However, because of an amazingly witless response to my post by veteran Detroit activist Danny Aldridge, who couldn’t “ascertain whether your warning concerning Charles Simmons is serious or humor,” I decided to cancel my Facebook.com account, which had come to seem like a waste of time — mine and my (few) readers’s. “WARNING TO OUR COMMUNITY: Watch out for one Charles E. Simmons, a.k.a. ‘Baba’ Charles Simmons! “On June 21, 2004, I circulated a letter to my ‘Short-short List’ of correspondents, which included a warning about this reputed Marxist revolutionary. According to recent reports, he’s again working to overthrow the government of the United States, or at least the government of the state of Michigan. Therefore, I’m reprinting portions of my original warning. Please be advised. 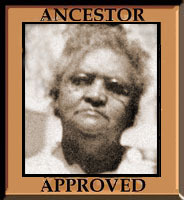 “‘It appeared in the 22 July 1963 issue of “The Illustrated News,” a hard-hitting, free eight-page weekly paper that was published and edited by attorney Henry Cleage, one of Jaramogi Abebe’s brothers. “‘In July 1963, Cynthia Scott, a young African American woman who was described by the local news media as a prostitute or streetwalker, was shot and killed by a Detroit police officer. “‘This was but the latest example of what many in the black community considered to be police brutality. Significantly, this feeling crossed class lines because ANY black person was the potential victim of police harassment or violence. “‘In response, the Group on Advanced Leadership (GOAL), a militant local civil-rights organization, organized a protest demonstration in front of police headquarters at 1300 Beaubien on 13 July. 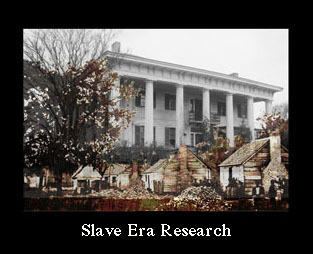 “‘GOAL had been organized the year before by a group of newly minted black nationalists, including brothers Milton R. and Richard B. Henry, Ed Broome, Charles Enock, Henry King and Henri Orr. 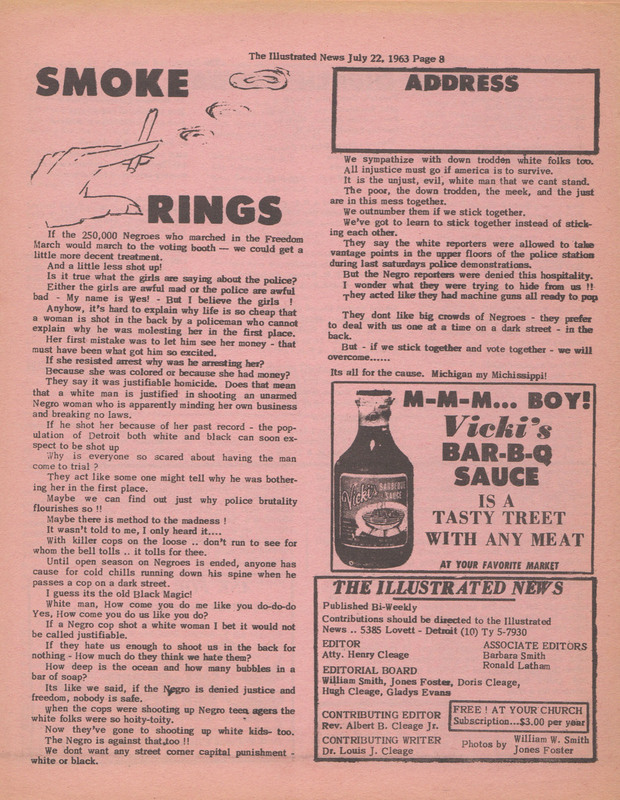 “‘The blunt-spoken Rev. Cleage, the pastor of Central Congregational Church, who, himself, was beginning to explicitly advocate black nationalism or “Black Brotherhood,” as he also called it, soon joined GOAL’s efforts. 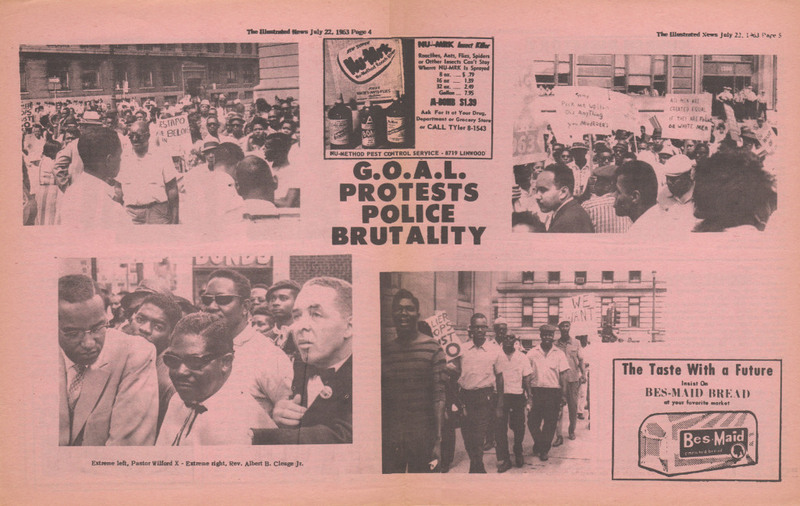 “‘GOAL fought for the “desegregation” of the Detroit Public Schools (and, significantly, led a successful battle against the anti-black or no-black biases in school textbooks), for greater employment opportunities and, in the fall of 1963, helped to found the Michigan committee of the Freedom Now Party, which sought to break with the “two-party” system that many “black” people felt disenfranchised by and field “black” political candidates. 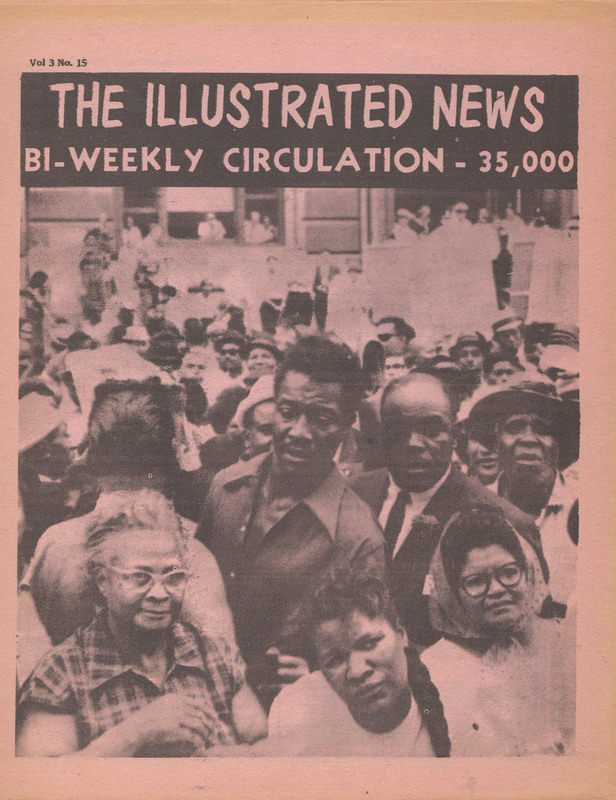 “‘Like the reaction to the Scott killing, the demonstration in front of police headquarters drew a wide cross-section of black people, including aspiring politicians, business persons, housewives, hustlers, students, workers, ministers, black nationalists and various strands of the left (socialists, communists and splinters of same). “‘Quite unusually, it even drew Wilfred X, the minister of Muhammad’s Mosque No. 1, Detroit, the local branch of Elijah Muhammad’s separatist Nation of Islam (NOI), which usually eschewed political activism. “‘Min. Wilfred was the eldest brother of Malcolm X, the charismatic New York NOI minister, who was, himself, chaffing under the “non-engagement policy,” as he would later call it in his posthumously published autobiography, imposed by Mr. Muhammad. “‘In the attached photo, Min. Wilfred can be seen at left, flanked by the Rev. Cleage [Jaramogi Abebe] at right, who is wearing a “FREEDOM NOW” button on his left lapel. “‘Behind and to the left of the Rev. Cleage, wearing a tam or, as we called it back in the day, an “apple hat,” is an unsmiling Charles Simmons, who was an auto worker and Wayne State University student. “‘Simmons was a member of Uhuru, a militant student-worker grouping that managed to contain a wide diversity of political inclinations, from nationalist to Marxist. “‘Uhuru members were ardent supporters of Malcolm X, GOAL, Robert F. Williams, the then-exiled former leader of the Monroe, NC, NAACP, who was the first major black leader to call for–and organize–armed self-defense, and the Revolutionary Action Movement, led by Max Stanford (now Muhammad Ahmad), an “underground” nationalist-Maoist group. “‘More to the point, Uhuru supported any person or group that it felt was dedicated to change NOW. “‘Simmons later became of the best foreign correspondents that “Muhammad Speaks,” the NOI newspaper, ever had. In how teaches at Eastern Michigan University and continues his social activism, including the recent commemoration of the 40th anniversary of the Detroit version of Malcolm X’s “The Ballot or the Bullet” speech, which was delivered at Simmons’s home church, King Solomon Baptist. Thank’s for sharing this Paul. It could have been another post. Thanx, but I was only trying to complement your post. My goodness, your scans of “The Illustrated News” are amazing! You’re creating an impressive and exceptionally useful online library/archive. Very interesting, and as ever I’m amazed that you have so much printed matter as well as your wealth of photos. You even have a policeman with the beginnings of a belly (like the one in prompt) which he appears to be contemplating. And I’m sure there was twice as much thrown out that I missed! I’m not sure, but I think that the buff-looking “black” man standing opposite Richard B. Henry/Imari Abubakari Obadele in the above photo is Reginald (Reg) Wilson, who, as you would recall, was then associated with James and Grace Lee Boggs on the radical “Correspondence” journal and later became a president of Wayne County Community College (WC3). 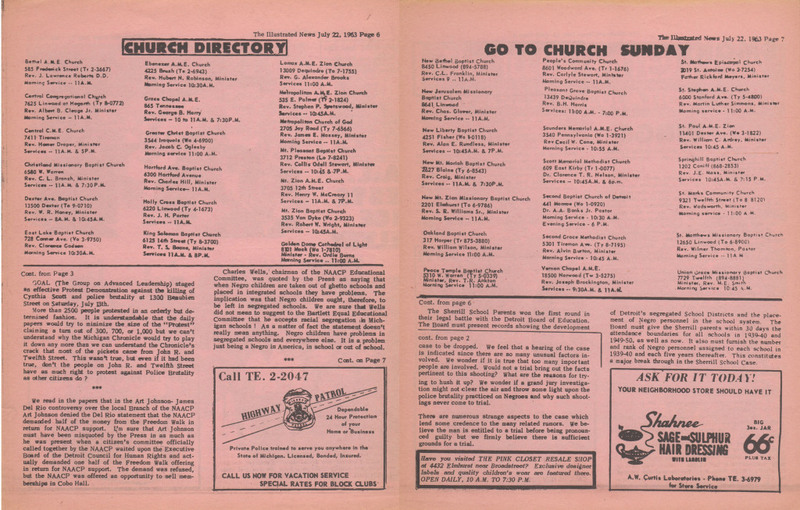 As you know, Reg was regularly attended the community programs at your Dad’s Central Congregational church (later Shrine of the Black Madonna #1). I remember Reginald Wilson. I don’t think that’s him. Paul Lee is right — you do indeed have an amazing collection of photos and posters and newsletters, etc. The personal nature of these things makes them especially valuable. I admire your father for always being in the thick of things, living what he believed in and being an example for others. Shot in the back! Incredible what went on. I continue to hope that “justice for all” will prevail sometime, but it seems to be more elusive than ever when you consider the state of the world. The newsletter brings those events back to life once again. Still going on, that is the tragic part. It was very interesting to read your account of something which took place in my lifetime – in 1963 I was studying history & politics of Britain & and USA and could relate to the issue of the day on civil rights & desegregation. 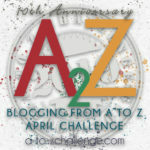 A very informative post reminding us of something that happened not all that long ago. Every time I see reports of events like this I’m glad we don’t routinely arm our police. Yor collection of news reports must take up a lot of room. it seems “open season on Negroes” is yet to end, leaving people still with “cold chills down their spines”. I hope my husband’s police relatives weren’t involved in any brutality, but I don’t know, because of course it’s not something that would be remembered in their family history.